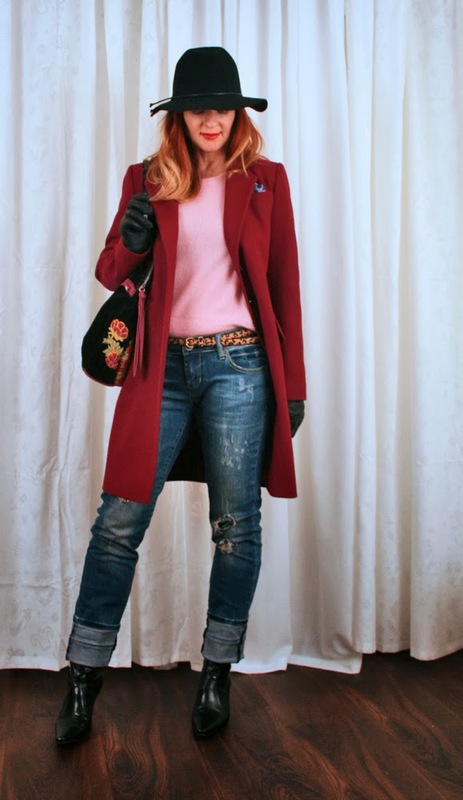 While pink seems a natural choice for February’s “How I Wear My” because of Valentine’s Day, Adrienne of The Rich Life (on a budget) and I never could have predicted the amount of pink we’d see, from the red carpet to magazine editorial spreads. Have you noticed that it’s everywhere right now? When the pictures started coming in it was interesting to note what shades of pink people gravitate towards, and hands down it is the hot and dark shades of pink that seem the most popular. 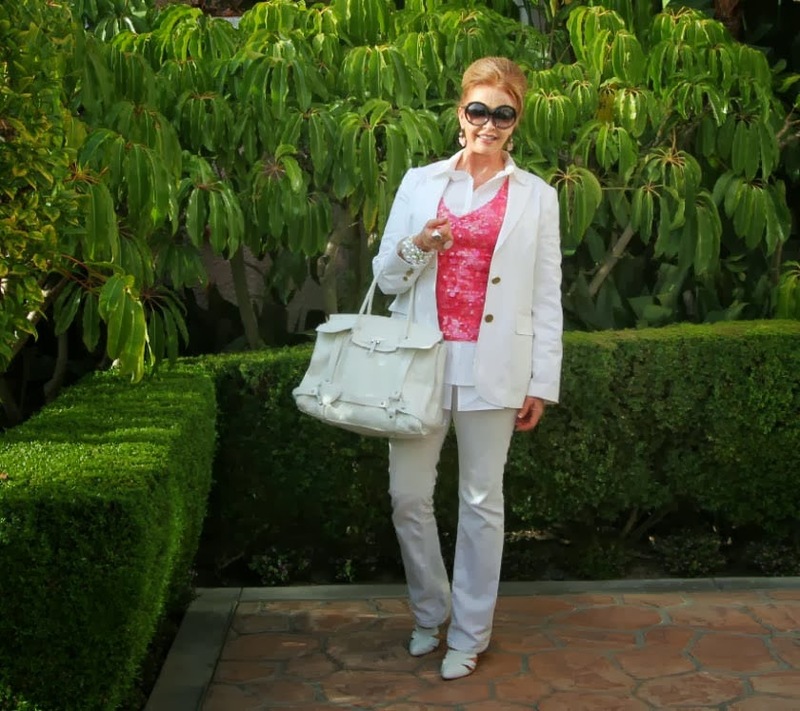 Pink is a color everybody appears to have a little of in their closet, whether it’s a blouse, blazer, or bag, so enjoy this visual La Vie en Rose and let it inspire you to put on some pink today! 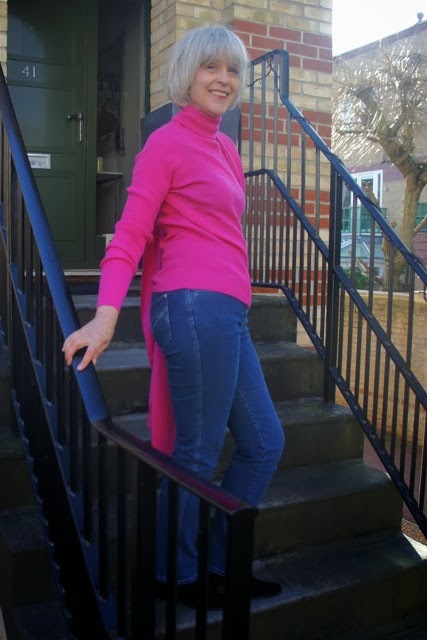 Adrienne, above, of The Rich Life (on a budget), my beautiful “How I Wear My” partner, is using pink accessories to take this utility jacket and pair of black pants up a notch. I love that she used the pink clutch (which she won through a giveaway hosted by Pam of Over 50 Feeling 40), pink pumps, and a big necklace to put a glamorous spin on this outfit. Cynthia of My Rose Colored Shades (perfect name for this particular roundup, right?) is wearing a great black and white windowpane sweater, which pairs so well with her pink Coach clutch, as well as her scarf, which her 9-year-old daughter bought for her this past Christmas with money she saved up for presents. What a sweet girl and what a great scarf! Style definitely runs in this family, I can tell. What a great jacket on Sheree and I hereby proclaim her the Queen of the White Pump because nobody wears them like she does! My favorite kind of punch! And do not get me started on the very chic Saint Laurent bag because I tell you, I definitely want one after seeing Deja carry it. I love how she has styled it here with that great black bag, black leggings, and patent flats. I think this is so wonderful and balletic! She has on a Weston Wear lace blouse, which I just love with this textured coat with leather lapels and inserts. I also like her T-strap shoes. What a stylish look for winter! 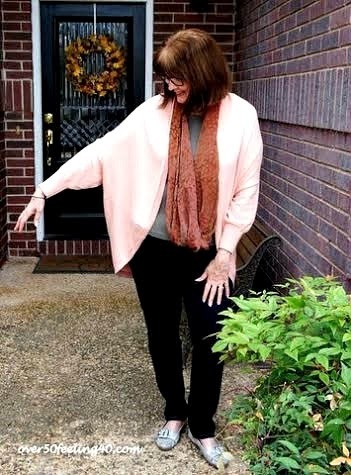 Cheryl of Northwest Mountain Living is wearing a pink coat by MetroStyle, so beloved to her that she tries to not wear it too often so it won’t fall apart. I know that feeling about special pieces in my wardrobe! Grace Kelly would approve of this look. I do too. And doesn’t her bag look EXACTLY like a Kelly? Josephine of Chic At Any Age. Josephine of Chic At Any Age is wearing such a great shade of pink that really highlights her perfect skin and gorgeous silver hair! Suzanne Carillo of Suzanne Carillo Style Files. 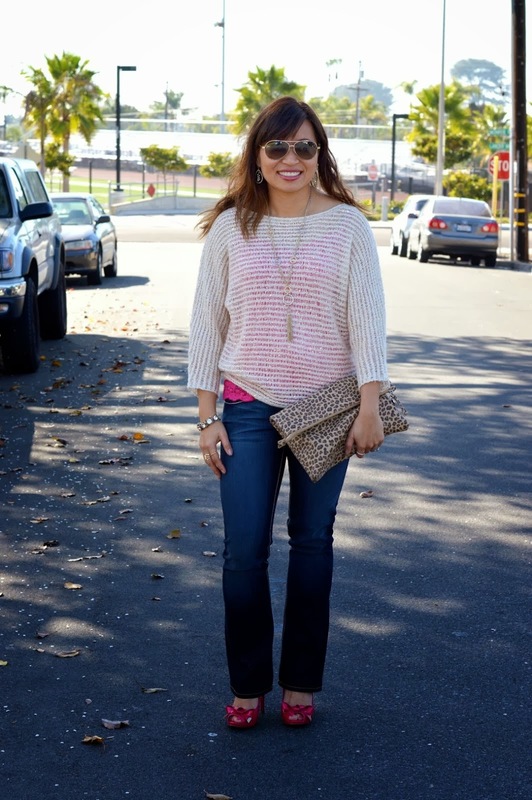 Suzanne of Suzanne Carillo Style Files has paired this sweater in a very pretty pale shade of pink with a dark red coat—and I love the unexpected combination. It seems perfect for Valentine’s Day, don’t you think? 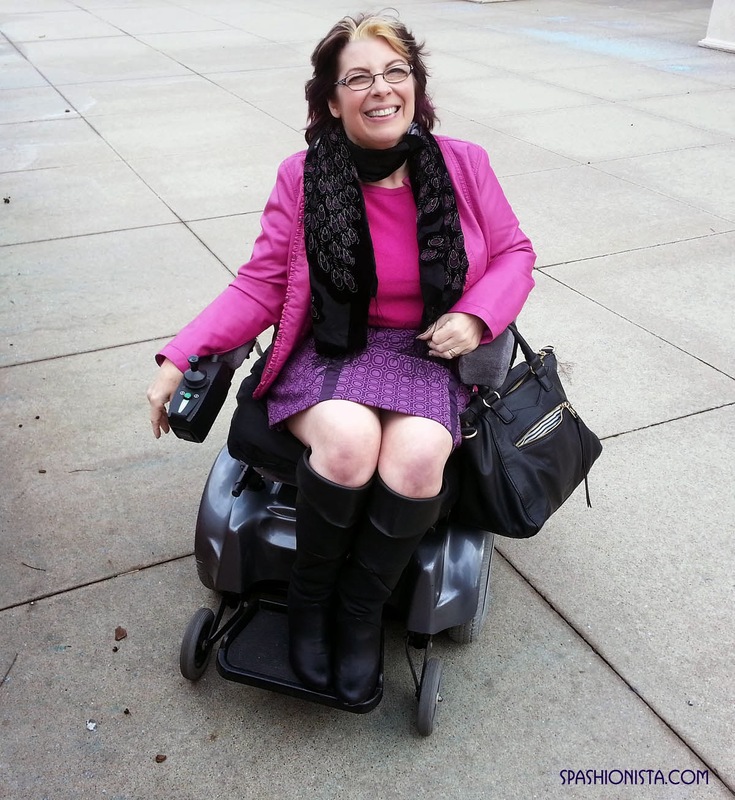 Alice of Happiness at Mid-Life is wearing another way I love to see pink worn—as a layering piece. I think this is a great flirty and fun combination of a mesh top, a pop of pink underneath, with pink pumps to cap off the outfit. And it’s been so cold and snowy here in NYC, please don’t mind me if I weep a little over the sight of sunshine and palm trees. Every time I see a Preen print I want to fill my closet with their clothes and this one is no exception. I love this very modern take on a floral print! 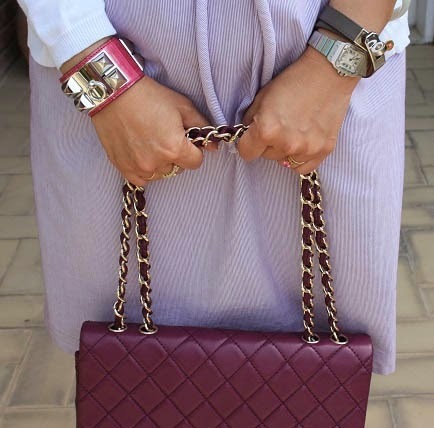 Alicia of Spashionista is mixing her pink with a print skirt in the color that I now think of as radiant orchid. So on trend and I like the unusual scarf as well, which she purchased from a vendor at a local Greek festival. I really these darker shades of pink mixed with orange and purple, don’t you? Holli of This Best Life. Holli of This Best Life is wearing a hot pink Anne Klein blouse that she thrifted. I love it paired with that giant patterned scarf! This is one of my favorite shades of pink—that very dreamy blush pink. 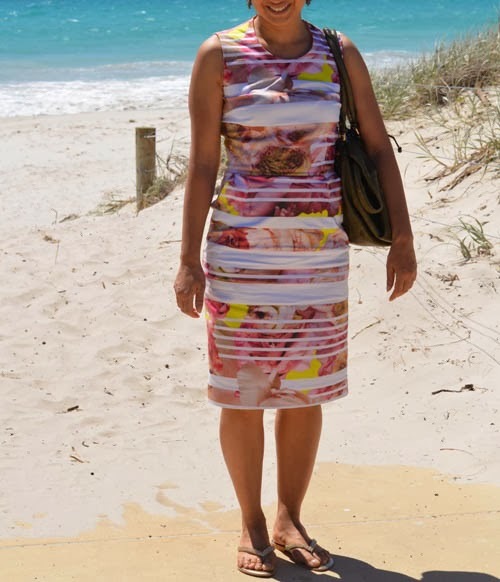 Paula of Fashion Over Fifty. Paula of Fashion Over 50 wrote, “I don’t have much pink, not that I dislike the color, I just don’t have much right now! This was a new purchase from Marshall’s—wool tweed skirt, $19. 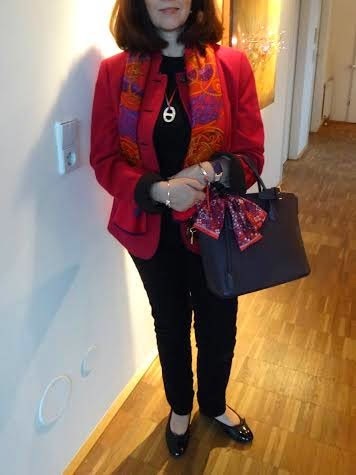 Paula is always fearless when it comes to mixing bold colors and patterns and this look is no exception. I like that she has mixed the pink with pale gray, another of my favorite combinations. And $19 for a skirt? I need to go shopping with her! Dawn Lucy of Fashion Should Be Fun has the kind of bright pink coat I wish I had in my closet. It always makes me smile to see a gal in a brightly colored coat in the dead of winter when I am so sick of black, black and more black, and this is exactly the kind of coat that would give me a lift. I’m with her, I like to add pink to neutral-colored outfits. Espsecially if that pink comes from Hermès! I am so into white this winter (and I never get tired of sequins), so I am especially loving Tamera’s look. Standing at an old cigarette machine. It’s vintage Brooklyn, people! 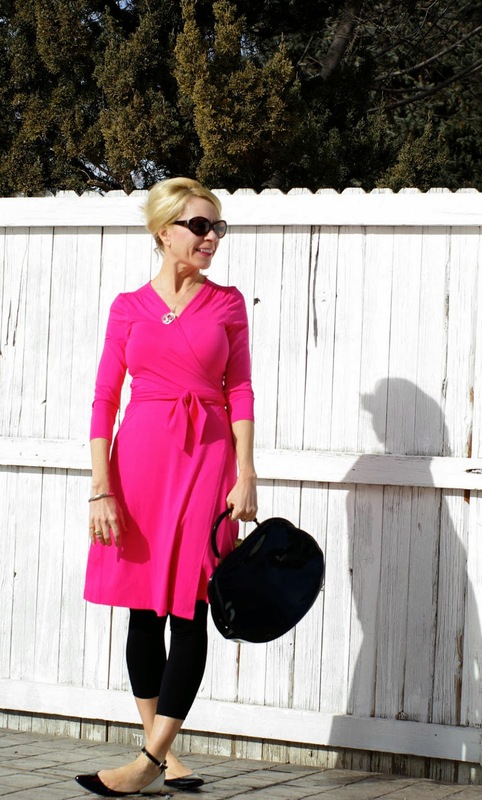 Like so many of the ladies here, I tend to favor the hotter or more neon shades of pink, and pink mixed with black remains a combination I never get tired of. I’m wearing a J. Crew coat (very similar to the one I wore in last month’s “How I Wear My: Coat”) and white jeans from Old Navy. The scarf is also from Old Navy and is about nine years old. It’s embellished with sequins and beads and has a satin side. It is definitely one of my favorite winter accessories! You know I never met a sequin I didn’t like. In the lobby of my friend’s apartment building in Brooklyn is an old cigarette vending machine. My friend and I thought it would be funny for me to act like I was on the hunt for nicotine but of course, this was just to be silly and get fun pictures, smoking is so bad for you and I don’t smoke! And, you’ll be happy to know, the machine is empty and unused. What’s smokin’ here is my New York tote by Sylvia Steininger. 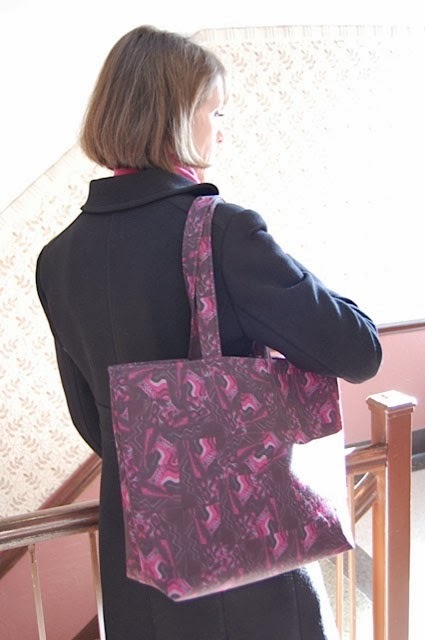 It was so great to carry my Sylvia Steininer New York tote to give you an idea of its size. 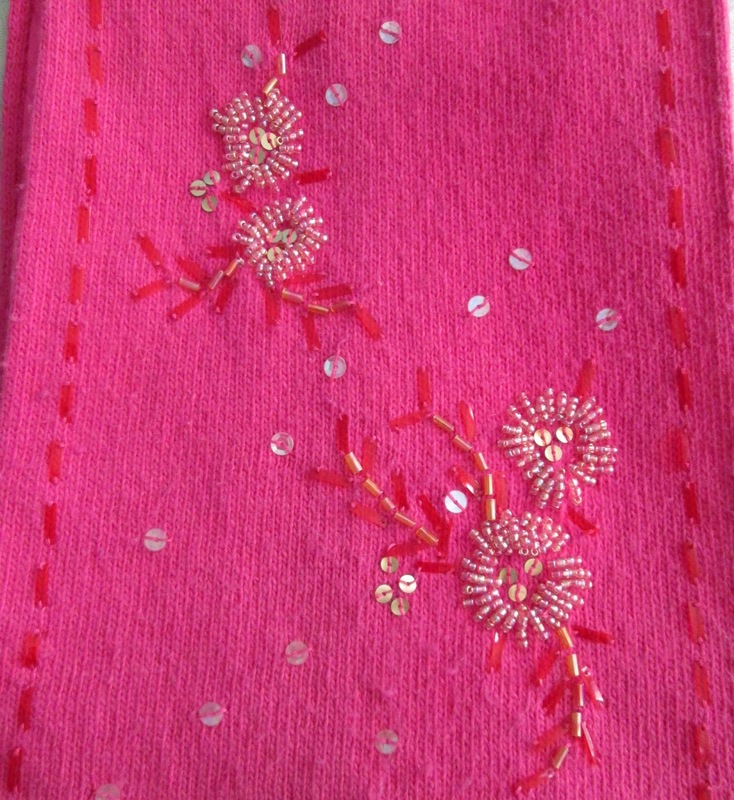 It really has some gorgeous shades of pink within the textile print. In case you missed it, you can read my full review of the bag here. The New York tote easily fits over my J. Crew coat. How are you wearing pink these days? For March, that trickiest of weather months, we are going to stick with an item that all of us are sure to still be wearing whether March decides to be a lion or a lamb (or both): boots. So whether you like riding, over-the-knee, combat, ankle, or lace-up versions, join us for “How I Wear My: Boots.” Send a picture to us at howiwearmy@yahoo.com by March 3, 2014. The pink party continues over at Adrienne’s. Check it out! So excited to be a part of HIWM! I get such fresh ideas and chic inspiration from this group of lovely ladies. As a new blogger, I have so much to learn, but I'm really enjoying the journey and all the cool gals I've connected with. Well, I think I am liking PINK better now...so many great ideas and inspiration! Thanks for another great link up, Jill! 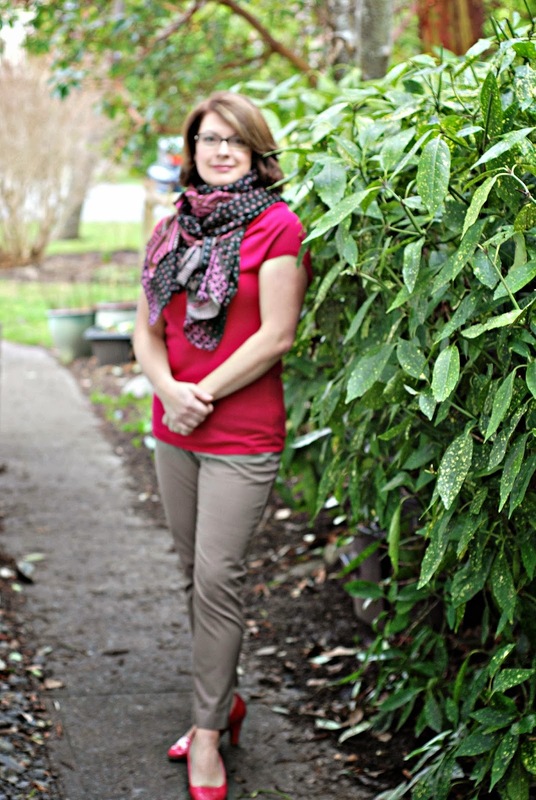 Jill, love that you are wearing white jeans in winter! They look fantastic on you! I am loving the pink coats--i could have me one of them! I'm really loving all of those pink coats, and your sequined scarf too! Thanks so much for including me. A really lovely selection of pink. Especially like some of the coats. Thanks for publishing my pic. I think these gals look so pretty in pink....I did look for something pink so I could join in but had no luck. Maybe next time! I always love this feature and seeing all the lovely pairings. Thank you so much for hosting! So many great looks! The bright pink seems to work on everybody. So funny that they kept that vintage cigarette machine. Jill, this post brought such a smile to my face today seeing all these gorgeous ladies so 'pretty in pink'. What a great HIWM idea. I know I came away thinking I surely need to add a bright pink coat to my closet, (yes, the one I said I wasn't adding anymore pink to). I also love the little pink shoes and adding a tiny bit of leopard (yes, you Suzanne with that belt) with the pink. I also love that you're wearing your white jeans in winter perfect pairing with that gorgeous scarf. So many pretties in pink! I love it! You rock that Sylvia Steininger tote, Jill. I love it with your black coat and scarf. So many vibrant pinks with a little pastel pink, too. Love this post...and look forward to BOOTS next month. How fun it will be! Thanks for showing us all these lovely people from all over the world showing off their pinks. It's one of my favorite colors and as I can see - not only mine. The other ladies look absolutely fab! Jill dear-Thanks again for hosting the HIWM series! Everyone looks so 'pretty in pink'. I'm especially loving those pics of chic you with the vintage ciggy machine....so NYC! PS-that cigarette machine is hilarious! Jill, Great post as always and loved seeing all the girls! I also love your Sylvia tote. It's so nice with the pink scarf and dark coat. Just read your post below..So excited about skating! I can't wait. Thanks for the head-up about it starting tomorrow night already! Yes, I remember Torvill and Dean and also Denise Bielman! Jill I'm so sorry I missed pink this month - unusually for me I just haven't worn any lately! Your ladies all look wonderful as always, and I love how there's just about shade of pink worn. See you for boots next month...! Thank you very much Jill! I know I say it every time but that's the beauty of HIWM - everybody looks wonderful and I always find inspiration. I own one pink thing - a cashmere/modal scarf that I only wear in the summer (don't know why I limit myself). I am so inspired by how lovely all the entrants look in various shades of pink!